Hey, everyone! Carol here! There’s so much to love about July itself – the Fourth of July is a BIG one, of course! Getting together with friends and family and celebrating independence is always fun! But we have this one set of friends we’ve known for like…20 years or close to it anyway. They own our local Chick-fil-A and for many years owned the mall store. So we never “did Christmas” anywhere near Christmas. They barely had time for their own families that time of year. So we started doing November birthdays (me and Steve) whenever we did Christmas – usually February or so. 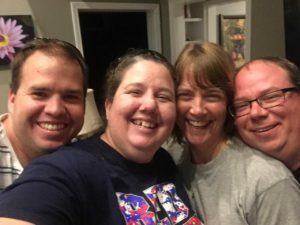 But over the years, that has evolved into doing Christmas, November birthdays, and summer birthdays (my husband, Matt’s, is in June; Steve’s wife, Ginger’s, is in August) all at the same time, and usually sometime in the summer. And, you guessed it, we often have Christmas in July! 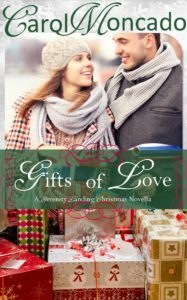 So to celebrate Christmas in July, I released my Christmas novella, Gifts of Love, as a single. Previously, it was only available in the Snowflakes and Mistletoe collection. But, really, is there any seasonal limitations on gifts – or love?! Plus, it’s super hot here this July, and reading about winter and snow might make me feel cooler ;). We first met Samantha and Vince in Good Enough for a Princess but Gifts of Love can be read as a stand-alone. He had a point, but she didn’t care. She wasn’t in the mood to celebrate anything. Normally, she put out a veritable cornucopia of Thanksgiving decorations, but this year? None. “Why are you really here, Vince?” She pushed the front door shut and found him with his head in her refrigerator. Her nearly empty refrigerator. That sounded appetizing. But it still sounded better than going to Vince’s sister’s house. She’d done that for Thanksgiving once. In college, right before their second date. In fact, Vince had been happily friending along when they went to his sister’s, because her parents had just moved away. Then, under the influence of eggnog and pumpkin-flavored-everything, he’d asked her out, and she’d been foolish enough to say yes. The two things in her life she truly regretted were dates with the man standing in front of her. His maddeningly casual demeanor and easy smile as he leaned back against her newly remodeled kitchen counter irritated her to no end. “So which is it going to be, Sami?” He hopped easily onto the counter behind him, his heels hitting the cabinet doors lightly. “Option three. You leave. I order pizza.” She crossed her arms again and glared. Something he must have become immune to. Oh! He knew she hated that nickname, even worse than being called Sam, a throwback to her tomboy days. “Fine. But I’m driving myself.” No way did she want to be stuck there at the mercy of Vince and his Camaro. Samantha glanced down at her ratty sweatpants and a Serenity Landing Elementary II t-shirt that had to be at least a decade old. Not sparing him a glance, she went down the hallway to the master bedroom, as far away from the kitchen as she could get, and slammed the door behind her. She didn’t bother to lock it. He wouldn’t come in. She did her best to stall for more time and come up with some story that would get her out of this, but nothing came to her. Finally, with her favorite jeans on and paired with a sweater in Thanksgiving colors, she slid her feet into knee-high black boots with the three-inch heel. Her feet would be killing her by the end of the day, but she’d look great. After putting on some lip gloss, she grabbed her purse and went back to the kitchen only to find Vince down the other hallway, near the spare bedroom and library, looking at a picture collage. “You and Tricia were tight.” It wasn’t a question because he’d been there for all of it. So that’s what picture he was staring at. The one of her holding Tricia’s baby girl, the baby Tricia abandoned with Charlie just a few weeks later. “Yes. She wouldn’t let Charlie in, but her mom was with her during the birth. I was the first one they let in after that.” Did he realize how painful that day had been for her? But she knew, when she did start dating again, it wouldn’t be Vince. If you follow me on Facebook, you’ll sometimes see me post pictures of a friend’s rec room where I go write. That’s actually Steve and Ginger’s house. This book was written (mostly) in two long days in that room – in August – with Ginger’s Christmas CDs to help me along ;). Have you ever celebrated Christmas in July? We are headed over to Steve and Ginger’s for the 4th and will likely make our plans then :). One lucky commenter (before July 15) will receive a Kindle copy of Gifts of Love! Samantha Dean has two major regrets in life-and both of them are dates with Vince Roberts. But somehow, since they started teaching at Serenity Landing Elementary II, he’s managed to worm his way into her life and make himself indispensable. Vince Roberts has loved Samantha since their first date, though he hasn’t done the best job of showing it. Spending time together is one reason he volunteered both of them to plan the staff Christmas party. They work together to take care of one of their own, dealing with the recent death of her husband in a house fire. As they plan the party, Samantha tries to keep Vince from finding his way into her heart. Will she admit the feelings that have been growing for so many years or walk away from Gifts of Love? Ooo! I never thought of it from a southern hemisphere perspective! I mean, I knew Christmas was in the summer, but not the Christmas in July thing. My family’s big thing when I was younger was “September Birthday celebrations”! Besides my mother, I have one uncle, and three cousins who were born in September. We’ve never celebrated Christmas in July, but with temperatures near 100 degrees and humidity levels just as high, I could go for some December weather right now. I enjoyed the excerpt, Carol…thanks for sharing! Hi Carol! Our family has never celebrated Christmas in July, because we celebrate all spring, summer, and fall. We have several March birthdays. Around Mother’s Day we celebrate May birthdays. Around Father’s Day we celebrate June anniversaries. July is my husband’s birthday. August are more birthdays. October we have a birthday and anniversary. Around Christmas we also celebrate our grandson’s December 19th birthday and January birthdays, because in Michigan we never know when we will have a blizzard. With our sons grown and families of their own, we usually celebrate the weekend before Christmas. Our youngest son has an early January birthday. He often felt his birthday was just an extension of Christmas, since I did not take down the Christmas tree until after his birthday. Always enjoy the extra lights on those dark, dark nights. One year we celebrated his 1/2 birthday in July, so he could have an outdoor party with friends and play his favorite summer game flashlight tag. Even though I do not read many holiday themed books or books in general in July, I do enjoy watching Hallmark’s Christmas movies. Last fall I enjoyed reading your Christmas novella, Gifts of Love in the Snowflakes and Mistletoe collection. I’m so glad you enjoyed it! And my y’all have a lot of celebrating going on!!! Hi. I don’t think I have ever celebrated Christmas in July, but my cousin and her whole family have Christmas in July every year. That is when all the brothers and sisters and their families can get together easier since they don’t all live close. The only celebration I’ve ever did in a different time of the year was my birthday. When I was young my parents held multiple parties because since school year was off in January my friends were no all around and I’d have at least one new party when school was back on. Then sometimes we’d travel to see family and they’d have another party (in addition to the one at home with friends and neighbors). A couple of years ago when it was really cold (negative 22F) in January I just refused to do anything for my birthday and my friends suggested a half birthday in July. It was awesome. We ended up having a picnic while attending a performance of Shakespeare in the park by a local theater group. I guess the whole winter/snow thing is not for me. I didn’t actually see snow until my 15th birthday. When my kids were little we often celebrated Christmas in November at Thanksgiving so we could share with my in-laws. We have never done Christmas in July , my family is pretty traditional when it comes to holidays! Hehe! I am too. But with this particular couple, getting together with them during the holiday season was nearly impossible. By the time they worked full time at the mall all season then did family get togethers, there was no time left. So… earlyish New Year it was (usually Feb or Mar). One year we couldn’t get schedules to match up until summer…so…Christmas in July it is! I’m thinking maybe if I read your book it might fool me into believing I’m not as hot as I really am! Thank you for the giveaway! It is such a good book Carol. I loved reading about their story. LOL! That’s awesome!!! I’m so glad you enjoyed their story! Ah! I’m out of town (not tooooooo far but…) researching yarn conventions and yarn-y stuff for my next series!! I’ll be online in a couple hours and read through the responses ;). No, we never did Christmas in July, but it sounds like a great idea!. Actually, Christmas can be at any time if you feel like celebrating. We’re heading home from our annual summer vacation on the beach with family. We always enjoy seeing each other. In a week my youngest daughter is getting married. Our oldest has been married for quite a while. We enjoyed our grandkids and the new grand baby! That’s fantastic!!!! Not a big fan of the beach here, though. Too much sand every. where. the last few times we went ;). Now, NEAR the beach, I’m totally good with ;). Never celebrated Christmas in July but I do love all the Christmas movies that are shown in July. It’s nice to rekindle the Christmas spirit in the heat of our summers. Hi Carol, Christmas in July is fun :) It makes sense in Australia for those of us who dream about experiencing a real white Christmas. I have never celebrated Christmas in July until today at a FB party. Funny thing; my husband, his sister & I all have August birthday’s. We really try to get together and plan something to do to celebrate. Distance is a major factor in us not always being able to, but that doesn’t stop us from trying. We had two years in a row where we’ve gone up to WA (4hr drive) to visit for a few days and attend a pre-season Seahawk NFL game at the stadium. Oh how fun was that!!!!!! Time, distance, and cost has limited us in doing that in recent years sadly!